Etiquette is an important part of the dicipline. 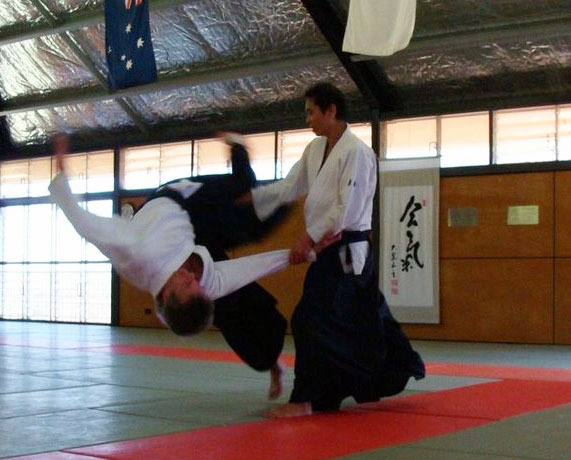 Aikido has its roots in Japanese culture; as part of the heritage of the art, Japanese terminology is used and certain aspects of Japanese etiquette are adhered to in the dojo. It is not too complex and students are not expected to perform faultlessly at first. Proper observance of etiquette is as much a part of your training as is learning techniques. In some cases observing proper etiquette requires one to set aside one’s pride or comfort. Matters of etiquette should not be considered of importance only in the dojo. Standards of etiquette may vary somewhat from one dojo or organization to another, but the following guidelines are nearly universal. Please take matters of etiquette seriously. When entering the dojo (‘place of the Way’, for us place of practice) please perform a standing bow to the Kamiza, which is generally the opposite site to the entry and may often be the place for Kamidana, a Shinto shrine. In our dojo it is the place which holds an image of o-sensei. It is expected that you leave the dojo the same way you have entered. Before class begins, approach the mat and perform a kneeling bow toward the Kamiza, when it is time for the lesson to begin sit with your fellow students ready to bow on. When you step onto the mat leave the world behind and enter into training with a focused mind and spirit. Please be aware at all times of those around you as you take ukemi (falling), or are throwing your partner. Train to develop awareness in all directions. Please try to arrive on time and help with the set up where necessary. If you are late, wait at the side of the mat until Sensei beckons you on. If you need to leave the mat before class ends seek an appropriate moment and ask Sensei quietly to make sure nobody is looking for you in alarm. If you know in advance you need to be leaving early before the end of the class, let Sensei know before class. Always leave or approach the mat in the same manner as above. There is no shame in taking a rest if you are tired. Please rest at the edge of the mat in seiza, but do not sit with your back to the Kamiza. If sitting in seiza is uncomfortable, sit cross-legged. “Onegaishimasu” – please instruct me; said to sensei at the beginning of class, to sensei after he gives instruction for a technique, and to ask a partner to practice with you. “Domo arigato gozimatshita” – thank you very much; said to your partner after practicing a technique and to Sensei at the end of practice. “Sumimasen” – I’m sorry; after a bump or mistake. On the mats: Be changed and on the mats before the posted practice times. When its time to commence class, students line up in seiza (sitting, in some other dojos in order of rank, new students at the right end and during practice, students mix and line up in random order). During class, discussion should be minimal; try to learn through senses other than hearing. Watch closely, try to get the feel of the movements, ask quietly (do not call across the mat) only when you do not understand. Generally it is better to ‘give it a go’ first, sensei will pick up that you have a problem . If against expectations it is necessary to speak, do so quietly. Personal hygiene reflects your attitude and respect for yourself, the discipline, and your fellow practitioners. Keep your dogi and yourself clean. Fingernails and toenails must be kept short. Long hair should be tied back. All jewelry must be removed. No shoes are allowed on the mats; please remove your shoes and leave them outside the door. Always wear foot-wear on the way to the mat and step directly from your foot-wear onto the mat where shoes are worn to edge of the mat! Some dojos maintain a shoe free zone on the approach to the mat area, a little like in Japan, in that case shoes must never be worn in such an area. In western society it is quite common to expect to be respected for ones achievements. It is natural that one might have difficulties at first to accept that all practitioners of Aikido consider themselves students with the aim to maintain a ‘beginners mind’ in which ones standing outside the dojo is irrelevant. A notion which worthwhile contemplating a little more in private.